Once a course ends, the After Action Review window will automatically appear. After Action Review allows you to step through each stage, target, and shot of a completed course and view shot placement, timing, and score. Shots are shown as colored circles which reflect the color of the target zone hit. Shows the stage name and number containing the target currently under review, as well as the amount of time the shooter spent on the selected stage. Use the arrow keys to move through multiple stages of a course (if any). Displays the name, number, and size of the currently selected target. Use the arrow keys to move through multiple targets (if any) of a stage and/or course. Progressing through targets will automatically move through stages as needed. Displays the number, timing, and target distance for the currently selected shot. Use the arrow keys to move through multiple shots (if any) to a target or multiple targets. 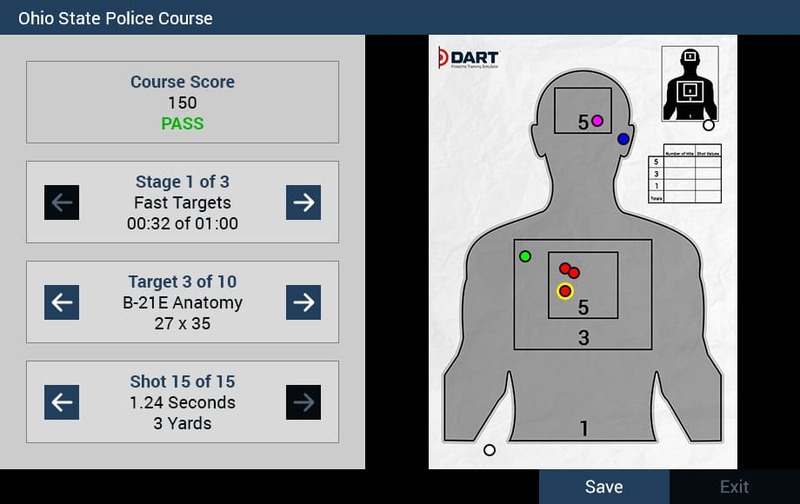 Progressing through shots will automatically move through targets and stages as needed. Note: Shot detail only shows shots that hit a target zone. It will not show shots that hit a wall or floor. Closes the After Action Review window. You can reopen the After Action Review window of the last completed course by selecting the Action Review button. Tip! You can view the After Action Review of the last completed course by selecting the Action Review button under the Courses menu.